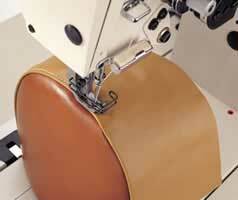 JUKI's PLC Series post-bed machines are ideally suited for the topstitching process for car seats and sofas. Now, a new 1-needle-type post-bed machine has been added to the PLC lineup. The machine feeds large-sized materials smoothly and firmly, ensuring consistent stitching performance without irregular pitches. 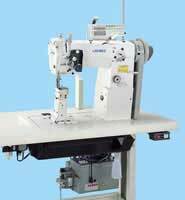 The machine is provided with full features such as a higher lift the presser foot and an increased alternating vertical movement for the walking foot and presser foot to facilitate the sewing of heavy materials. For the PLC-1610-7 provided with an automatic thread trimmer, a newly developed AC servomotor/controller is mounted. 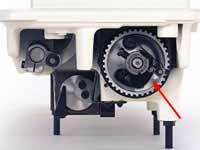 With its high power and quick operation, the motor goes further to improve comfortable sewing works. Consistent sewing performance at a high speed. Equipped with a unison-feed system that perfectly synchronizes the presser foot, feed dog and needle, the machine feeds large-sized materials smoothly and forcefully. This results in consistent sewing performance at high speeds without irregular feed. The presser foot rises up as high as 15mm. This allows the operator to place/remove heavy materials such as urethane on/from the machine with ease. The machine is equipped as standard with a pneumatic auto-lifter. The safety mechanism automatically prevents hook breakage etc., when the thread gets caught in the hook and other sewing troubles occur.  The safety mechanism can be quickly reset simply by pressing the reset button. Increased alternating vertical movement of the walking foot and presser foot. The vertical stroke (alternating vertical movement) of the presser foot and walking foot can be adjusted to 8mm at the maximum to accommodate the thickness of multi-layered portions of the material to be used. 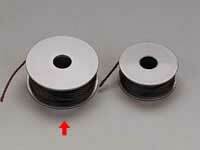 Frequency of bobbin thread replacement has been reduced. 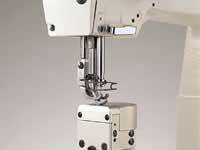 With its vertical-axis 1.6 fold hook, the frequency of bobbin thread replacement is reduced. This hook helps to upgrade efficiency and offers special advantages when using thick threads. The machine head structure permits easy operation. The post-shaped bed minimizes bed's diameter, thereby providing easy operation for three-dimensional sewing. 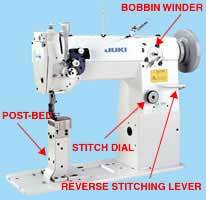 The bobbin winder is built in the front of the machine arm to permit easy operation. 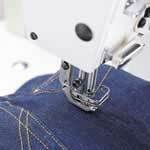 Reverse stitching can be easily performed by lightly pressing down on the lever. 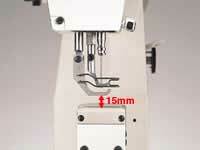 The stitch length can be easily changed by operating the dial mounted on the front surface of the machine arm.